The Cat Carrier. To many cats, the carrier is a scary place. 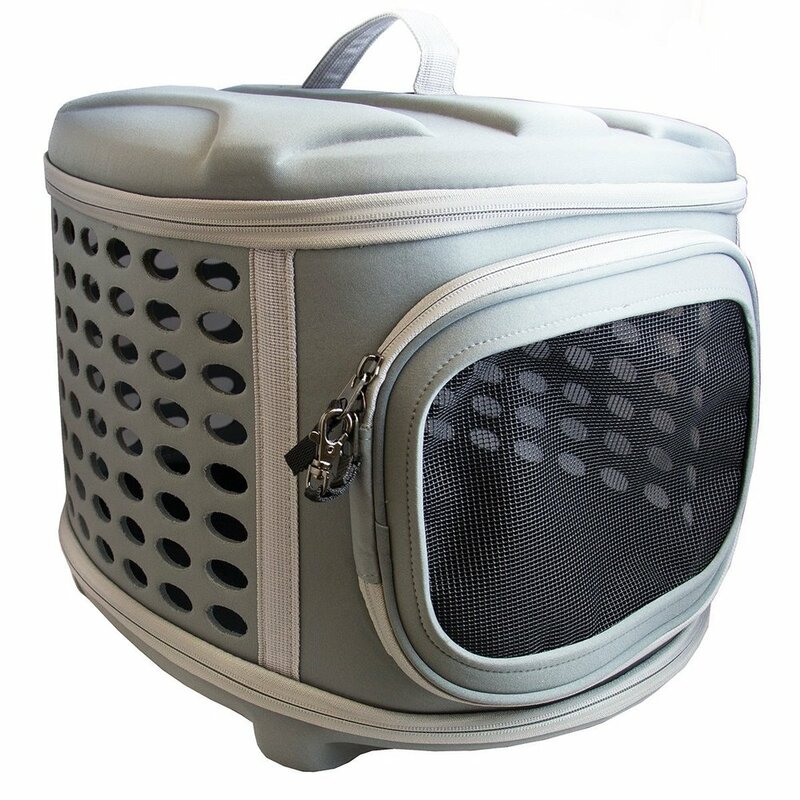 Usually the only time a cat needs to be inside one of these portable kennels is to go to a strange place – the veterinarian, the groomer, moving to a new home, or even to go live with a new family. Because of these negative connotations, many cats hate carriers. They can lash out at their owner when being forced into the carrier; they can stress out while inside it; and they may go to the bathroom due to being uncomfortable in such a small space. However, the carrier doesn’t have to be a cause of stress for any cat. This article will discuss the importance of cat carriers, the different types of carriers, how to introduce a cat to a carrier, and how the pet owner can get them inside the carrier safely. It is very important for a pet owner to be able to get their cat into a carrier quickly, easily and without causing undue stress to the cat. Many cat owners have expressed to me that their cats are more comfortable being held, wrapped in a blanket, or without any confinement during car rides, vet visits and grooming appointments. While this may be comforting to the cat, it creates a very dangerous situation where the cat is vulnerable to harm. Carriers keep the cat from escaping from their owner’s arms if they are spooked by a dog barking, a car horn, or any number of sudden noises. I have helped owners chase cats down major roads, through neighbor’s backyards and even under houses due to the cat escaping while not in a carrier. Luckily, all of the cats in those scenarios returned unharmed. But, it could have easily ended with the cat being injured by a car, another animal, or even being lost. Keeping the cat safe and protected inside a carrier prevents any of these situations from occurring. We ask that each cat arrives to our facility in their own carrier. This is for the cat's safety and comfort. Cats can easily wriggle out of owner's arms when transporting to or from the car. After grooming appointments, cat siblings can sometimes be cranky to one another. This is due to a change in each of the cat's smell (how cats communicate with each other), but this will subside after a day or two. Easily disassembled: some shy cats prefer not going through a carrier door. Alternatively, a carrier that has clasps instead of screws allows for an easy in/out, as well as an easy way to clean the carrier if the cat has any accidents. If your cat isn't thrilled about being in its carrier, start as early as possible (before any veterinary, grooming or boarding appointments) to acclimate the cat so it sees the carrier as a safe place. The first step is to bring the carrier into your cat's daily life. Bring a clean carrier and place it in your living room (or where your cat hangs out the most). It can help to put a small blanket or cushion inside the carrier that your cat has used before, since cats relate to smell very heavily. If it smells like them, it can be easier for them to feel comfortable with it. The carrier should be left in the living space for at least a few days. When you want to give your cat a few treats, place 1 or 2 immediately outside the carrier and then another couple inside the carrier. Once the cat walks into the carrier on its own, gently close the door while the cat eats the treats. If they are finished, put another one or two treat through the door of the carrier for the cat to eat. Then open the door and walk away. Next, continue with the treats inside the carrier and shutting the door. Once the cat is comfortable with the door closed, life the carrier slowly and walk the cat outside to your vehicle. Give a few more treats through the door once inside the car. Then bring the cat back inside, open the door and give another treat. We are going to continue this process every few days, until the cat is showing no signs of stress when in the car. The next step is to take a quick drive around the block, giving a treat when you return home. Go for progressively further and further drives. This should allow the cat to become comfortable in the carrier, in the car and going on short drives for any veterinary, grooming or boarding appointments. Schedule your cat's grooming or boarding reservation with Cat Naps Cattery in Hamilton, NJ here.